There is nothing less professional in a video interview than embarrassing technological issues, so download necessary software and familiarize yourself with it in good time beforehand. Test your webcam audio and visual quality as well as your Wifi; the camera should be eye level and you should interview somewhere with good internet connection. It’s all about the lighting. Make sure you are in a well-lit room so the interviewer can clearly see you but check for unflattering shadows or shine, get the powder out if you must! Find a simple and tidy room to interview in and clear the space behind you – make it easy for the interviewer to focus on you. If you are not used to video interviews, the first few calls may feel awkward if you don’t know how loud to talk, where to look and what to do with your hands. To avoid conveying this in your body language, make a practice call to a friend and figure out how to present yourself professionally. Check your posture too, even if you are interviewing from the comfort of your living room, you should act as if you are in the interviewer’s office. You should dress for a video interview as you would for a face-to-face interview. What you wear is even more important since you are not physically there. Do not be tempted to go trouser-less! Assuming the camera will cut off at your waist, you’re thinking how easy it could be to keep your tracksuit or pyjamas on the bottom half… but if you have to stand up to adjust your camera the game is over. Body language makes up to 90% of your first impression on video interviews, so nailing your eye contact, gestures and facial expression may be the key to your success! Eye contact: You might be tempted to look at the person interviewing you, or to check yourself out on your screen, but like in a face-to-face interview eye contact is one of the most important communicators. Look into your camera as you would the eyes of your interviewer. Gestures: Unnecessary movements can be distracting, while hand gestures are fine as you are speaking, ensure that they are contained. Record yourself practicing an interview. As it is harder to show active listening with video interviews, nodding and making listening sounds such as “yes” or “mm” show that you are engaged without interrupting them. Facial expression: Project calmness and confidence by maintaining a pleasant facial expression, this means smiling! As you would smile when you walk into the interview room, greet the interviewer on the video call the same way. 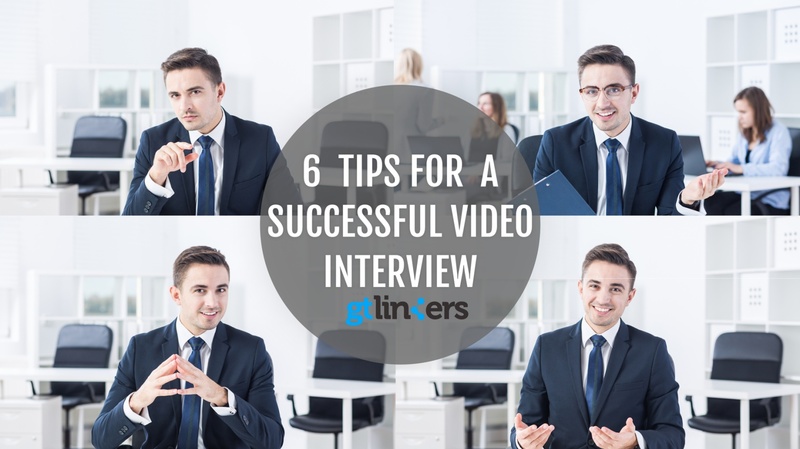 Sooner or later you will be asked for a video interview, use these tips to make it a successful one! As remote international recruiters, at GT Linkers we specialize in video interviewing and can help you practice for your next digital interview! Reserve a place in our Interview Skills Workshop for professional feedback and practice.